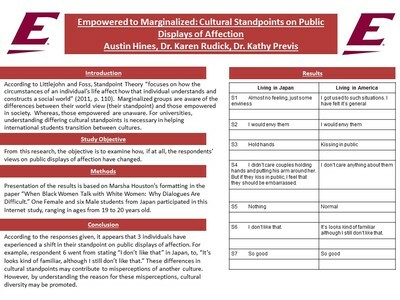 "Empowered to Marginalized: Cultural Standpoints on Public Displays of " by Austin T. Hines, Karen L. Rudick et al. According to Littlejohn and Foss, Standpoint Theory “focuses on how the circumstances of an individual’s life affect how that individual understands and constructs a social world” (2011, p. 110). Marginalized groups are aware of the differences between their world view (standpoint) and those empowered in society, whereas, those empowered are unaware. From this theory, we investigate how the Japanese population views public displays of affection as compared to individuals in the United States. In conducting this research, we explore shifts in standpoints from being empowered in one’s culture, to being marginalized in a new culture. 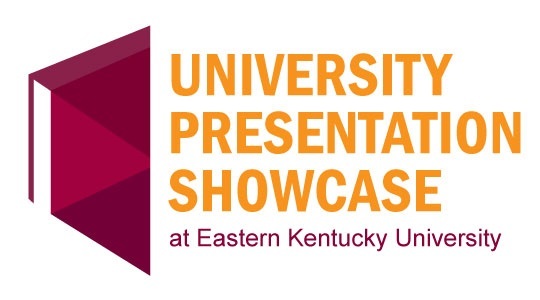 The research design and execution consisted of an Internet survey of students native to Japan. The survey questions asked were, “When you lived in Japan, how did you feel about a man showing public displays of affection for a woman (kissing in public, holding hands, putting his arm around her) in Japan?” and, “How do you feel now, after living in America about a man showing public displays of affection for a woman (kissing in public, holding hands, putting his arm around her)?” Because of a time restraint, the survey had seven online responses (one female and six male). By looking at the responses given, we examine a possible shift in standpoint on public displays of affection in one Japanese respondent. Because there were few respondents, paper surveys and interviews were also conducted. The Internet survey responses provide direction for future research and begin discussion on if, and if so how, shifts in standpoint occur.